The final studio on the tour resides in the hilly neighborhoods off of 2244 Bee Caves. Claudia Reese opened up her studio to display her own pots with the work of Lauren Smith, Naomi Cleary, and Meredith Host. Aaron and I munched on m&m’s with red wine from the snack table near the entrance, perusing the last group of talented potters’ art for the day. Always patterned beautifully, Ms. Reese’s current work did not disappoint. The square vessel has extremely nice visual texture, I think. A good variety of sizes from Claudia Reese. Meredith Host’s pots had a similar feel to Claudia’s in terms of decoration, although I feel like Meredith presented more refinement of form where Claudia’s seem earthier. Meredith Host works in an attractive color palette. The stippled floral designs blend well with the solid or banded patterns. The decoration style also puts me in mind of Kristin Kieffer, the queen of pattern-building through stamping. 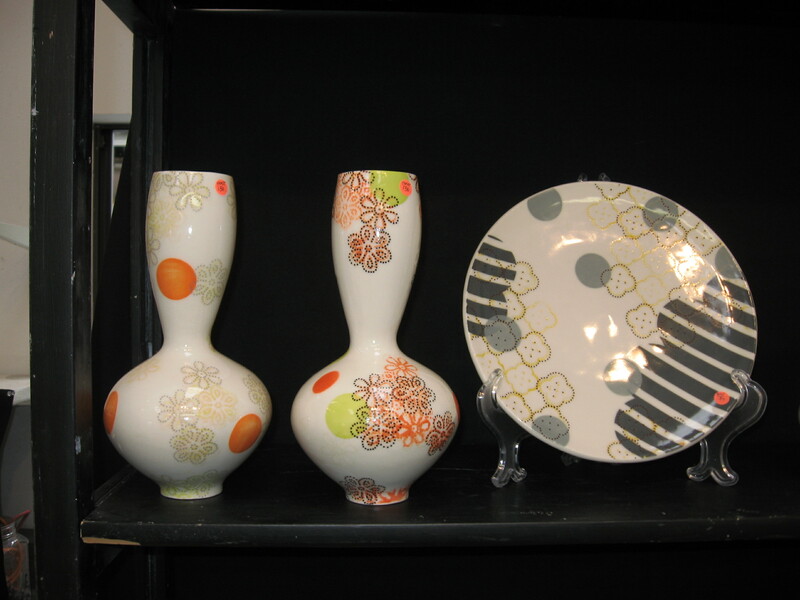 A close-up of two Meredith Host vases & a plate. The Japanese textile sensibility evident in the floral images definitely attracts me. The crisp edges and surfaces of the pots imply a certain practical use-ability and present an immaculate canvas for the decoration. Naomi Cleary mixes tight and loose pattern with slip texture, running glazes, and bold shiny color. I found the division of space in the individual pot’s imagery well-executed. The simply decorated yellow and red plate was a favorite of mine, in fact. 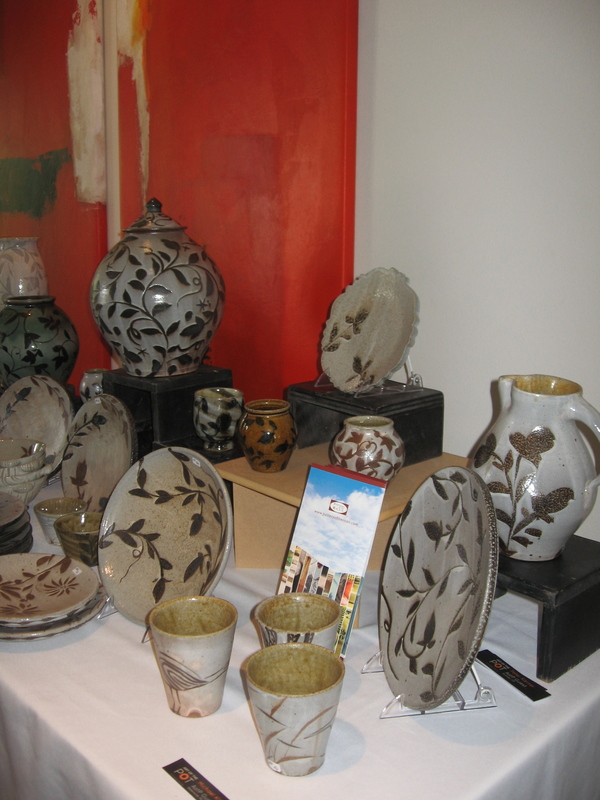 A table full of Naomi Cleary pots. What can I say? 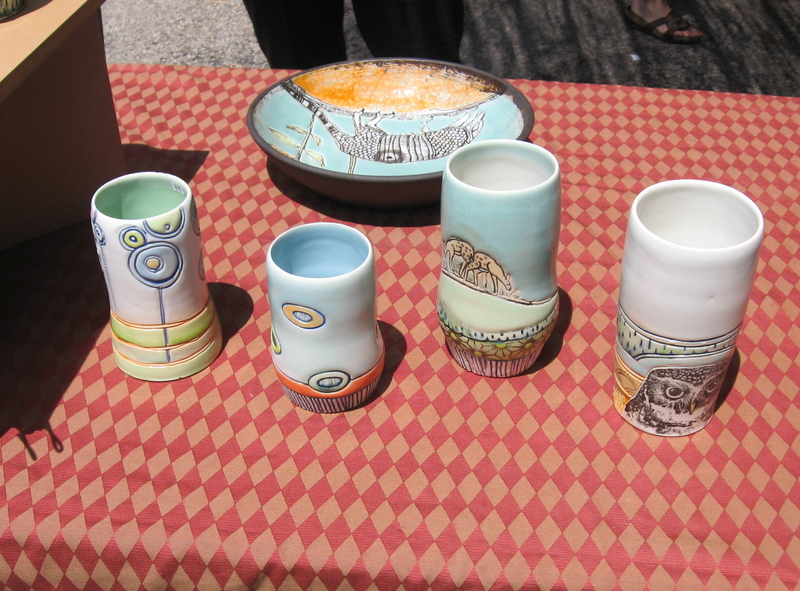 Here are some more great pots. The simplicity of the drawings put me in mind of Paul Klee paintings. Part of Lauren Smith’s display. Lauren Smith’s work was high on the list of pots I wanted to be more familiar with. I met Lauren once before in Dallas last year, sans pots unfortunately, but I enjoyed recalling our brief introduction and catching up a bit while looking over her display. I was impressed by the color and texture choices, the pillowy forms, and the feminine yet solid details. Something pleasing and viscerally charming starts happening when I handle her pots. The final AotP studio tour 2012 photo, of Lauren Smith’s work. I picked a medium sized batter bowl, which will perfectly accommodate my usual quantity of muffin batter or cookie dough. I looked longingly at the large jar photographed above, and the pitcher shown partially at the right margin. All in all, a great group of work to end the day on. Aaron and I set out to return to Dallas for a graduation party, before returning home in the wee hours for some well-deserved sleep. 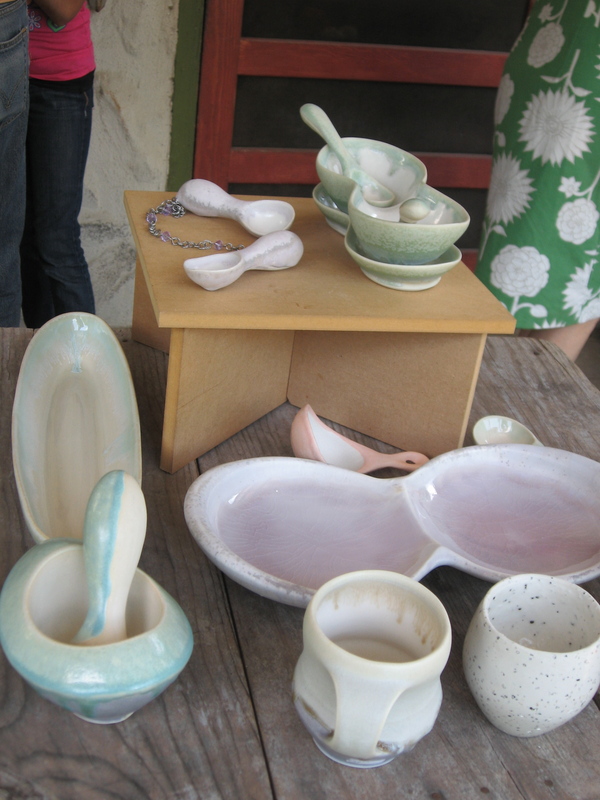 I’ve visited Austin for the Art of the Pot studio tour for several years now, and I’ll do it all over again next Mother’s Day weekend, too. I highly recommend a visit to the Texas capitol to see the killer pottery to any and all, for next year/beyond. 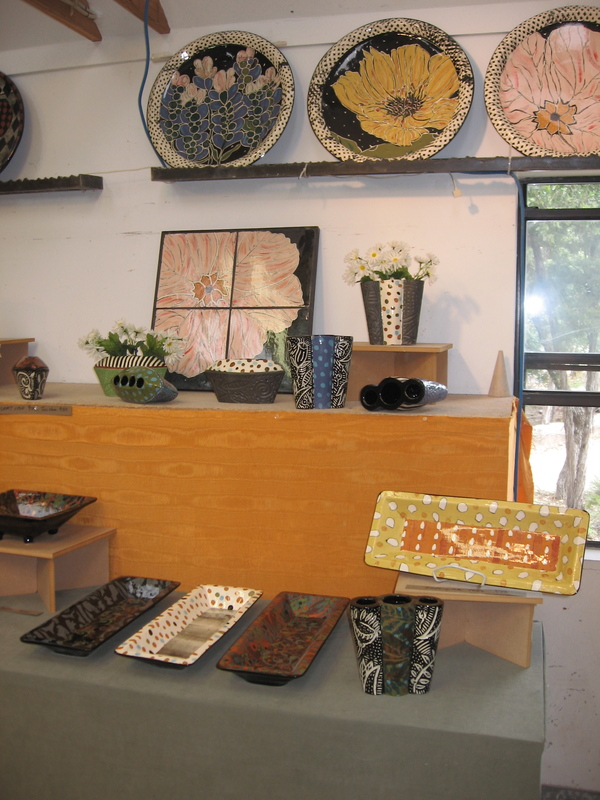 The shelves at destination #3 on the Austin, TX pottery studio tour, Keith Kreeger’s house, displayed the work of 4 potters: the host, Deborah Schwartzkopf, Michael Kline, and Peter Karner. I am already familiar with Deb’s, Keith’s, and Michael’s pots. I got a crash course on Peter’s work, although I have heard my university ceramics professor Peter Beasecker speak highly of his pots. Mr. Kreeger’s simply elegant forms marry well with the linear decoration and un-fussy glaze. The quality of craftsmanship gets emphasized by features like the crisp handles. The addition of summery Tito’s vodka cocktails, complimentary Chilantro korean bbq tacos straight off the food truck, and Byrd Collective flower arrangements created a wonderfully pampered and enjoyable atmosphere to discuss, peruse, and acquire gorgeous hand-made pottery. 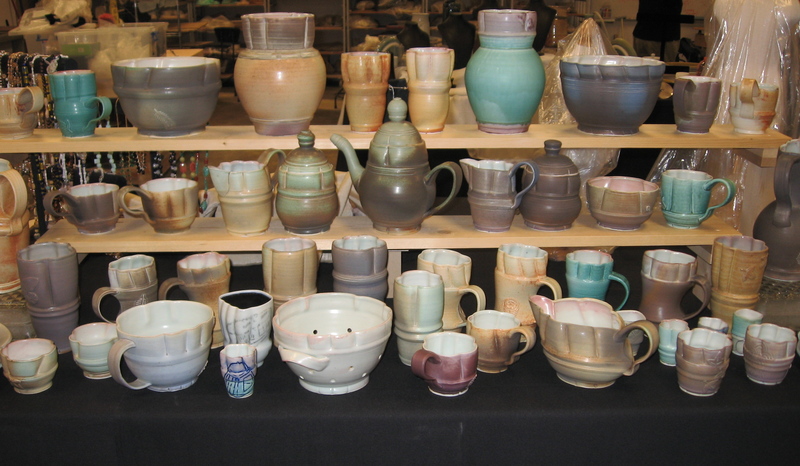 More of Keith Kreeger’s pots, including some brand new work decorated with colored slip banding. I like the new work with colored slip decoration; it has a nice aesthetic relationship to the monochrome pieces. 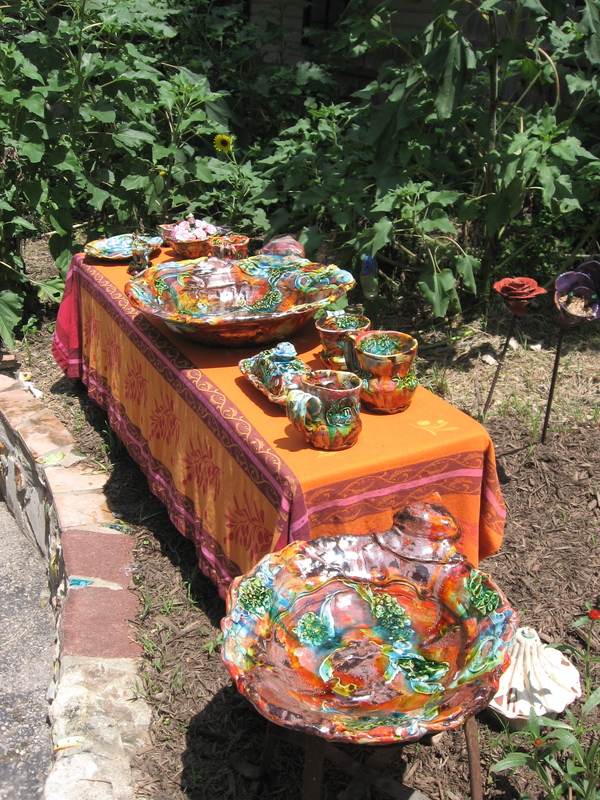 Part of Deborah Schwartzkopf’s display of work. The liquor cups are a recent development in Deborah Schwartzkopf’s studio, and I’m loving the more saturated and richer-hued glazes. 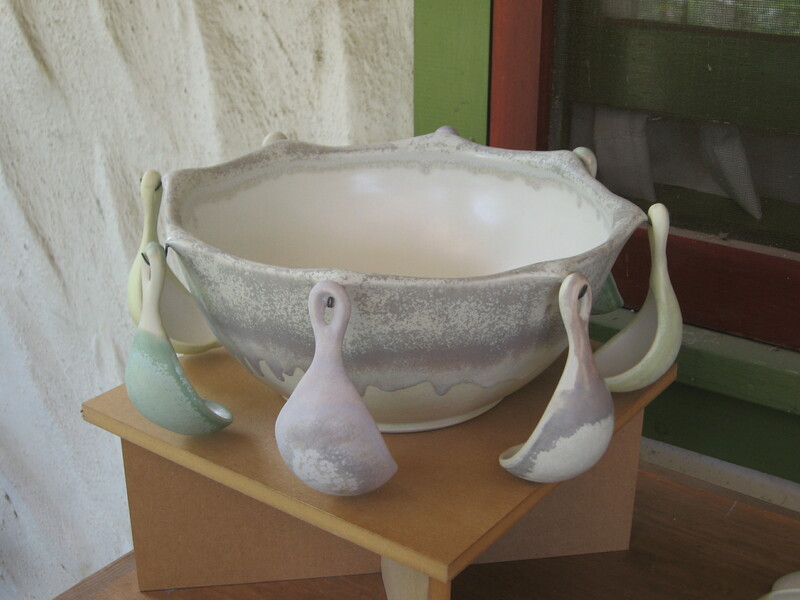 I already have a well-developed appreciation of and familiarity with Deborah’s pots, and I had the opportunity to add one of her sauce boats and juicers to my collection in April 2011 at the Dallas Pottery Invitational. 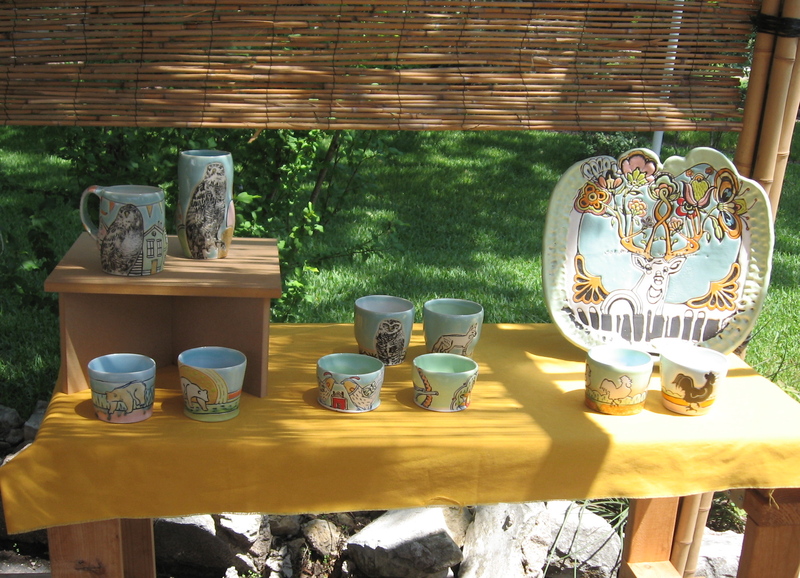 The first time I encountered Deb’s work was actually a cup I bought at the NCECA cup sale of 2006. The cup captured my attention, and a visit to the nearby galleries during the conference confirmed my interest. One of the galleries presented her work with pots and sculptures by other woman potters working with porcelain; Ladies in White, I believe the show was called. That first cup I found represented one of her paler, more primarily colored pots, and I still frequently reach for it in my cabinet. This red-orange satin glaze looks so luscious. The assembly of a pitcher like this requires numerous thrown and handbuilt parts. The handle is definitely an ergonomic success, feeling comfortable to grip with a snug fit for the fingers. 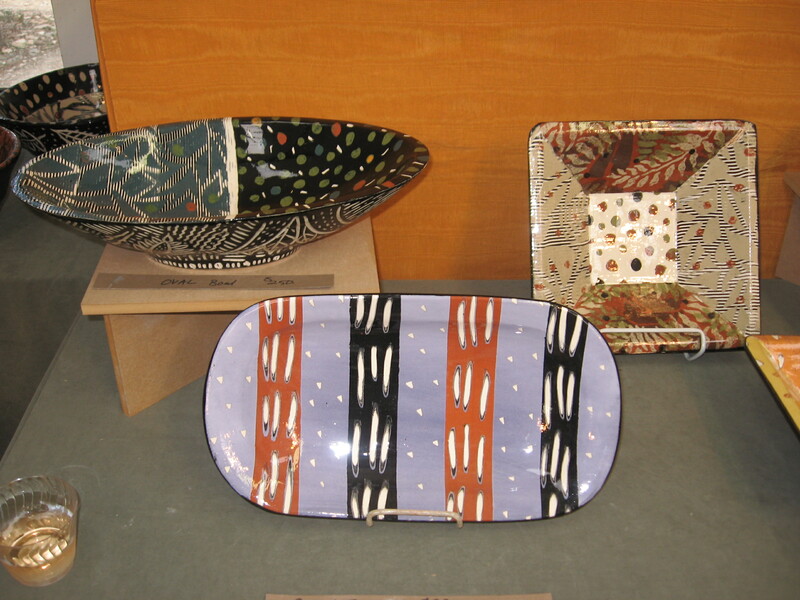 Wax-resist vine patterns twined across the stoneware pottery of Michael Kline. Mr. Kline’s work has an ambitious, solid quality with nicely resolved formal decisions. I loved the cut rim on the plate, and the generous swell of the bellies, especially on some of the larger pieces. A large Michael Kline jar. 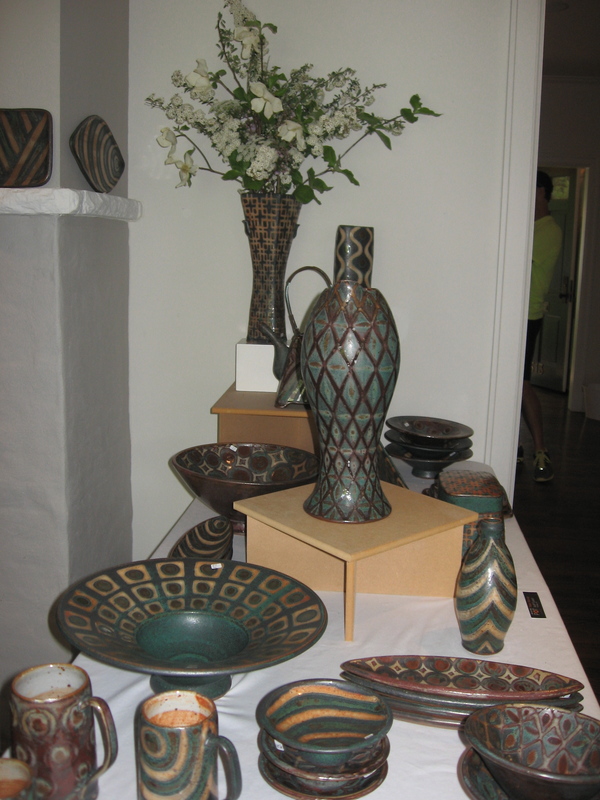 Aaron’s favorite of Michael’s work was a green-glazed vase with vine patterning and finger combed slip, which I agree looked beautiful. I picked this large jar, which has a gorgeous form, faintly Persian sensibility, and a stellar decorative relationship to the size of the pot and the curvature of the walls. Peter Karner’s primary display table. I did not have much familiarity with Peter Karner’s work before the tour, beyond the occasional positive reference when we discussed the current pottery world of artists during my time as a University student under Peter Beasecker’s tutelage. The layered glazes, ambitious forms, well-resolved aesthetic decisions, and excellent craftsmanship evident in Mr. Karner’s pots all appealed to me immensely. 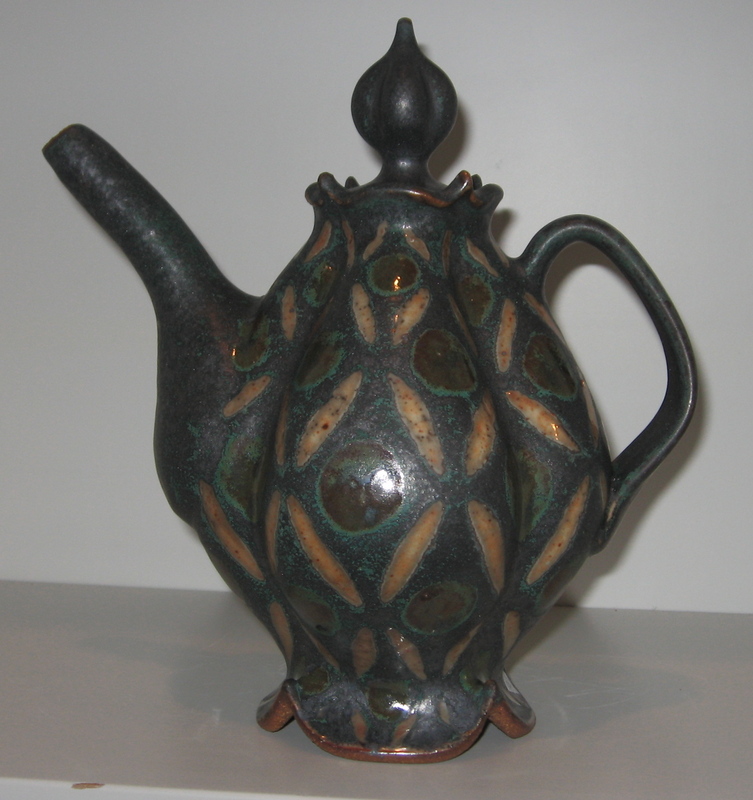 My new Peter Karner teapot. I found myself returning to this particular teapot repeatedly, despite my effort to strictly enforce a purchasing budget. For pottery only, I attempt to listen for that undercurrent of attraction, because invariably a piece I can’t walk away from will feed back into my own studio practice as a positive influence. Peter told me the story of this particular form; a friend’s daughter had a plastic Aladdin tea-set, probably sometime soon after the Disney version premiered, which he did not pay much mind to. Sometime afterward this teapot form evolved. Over a decade later upon returning to visit this friend, Peter saw the Aladdin tea set in the garage, and the plastic teapot was the same form as the teapot he’d been making! I guess that’s what you call an embedded memory. 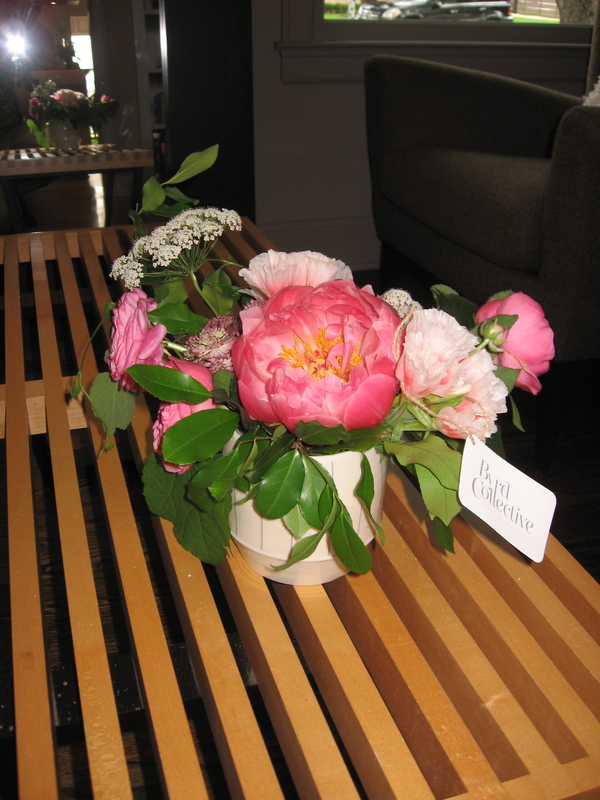 Byrd Collective floral arrangement in a Kreeger pot. 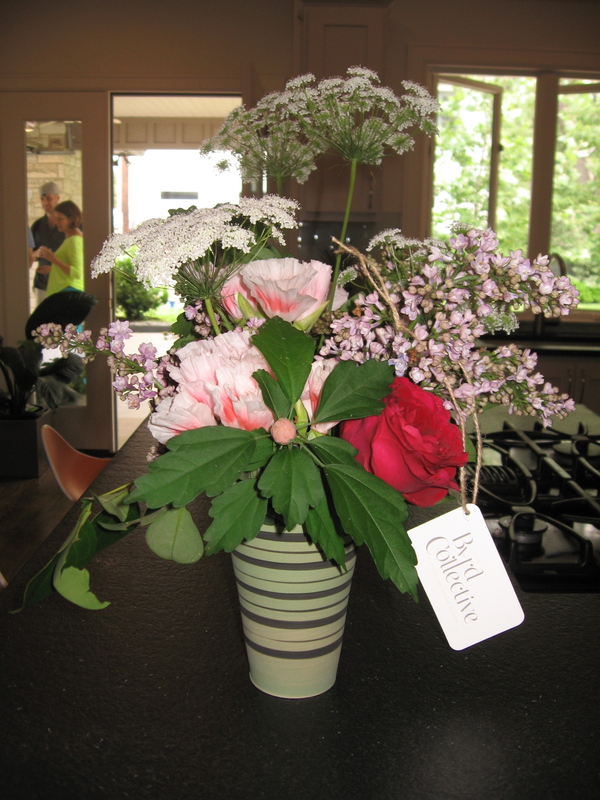 The Byrd Collective produced some nice Mother’s Day-ready floral arrangements for the event. The 4th and final installment to follow. TTFN! At studio #2, Lisa Orr’s house, AotP presented the work of the hostess, Brooke Noble, and Gwendolyn Yoppolo. I was especially excited to see the work of Brooke Noble for the first time. I am already impressed by and quite acquainted with the excellent pots of Ms. Orr and Ms. Yoppolo, and none of the artists disappointed. Part of Brooke Noble’s display. Those antlers are intriguing. Narrative animal pots have a special place in my heart, and Brooke’s also satisfy my attraction to color, texture, and pattern. I picked up a horse tumbler with vertical pattern/texture stripes. All of her pieces were interesting and incredibly well-crafted. Brooke Noble cups and a plate. Lisa Orr had the usual, killer work lined up all the way from the porch into her studio. I have a butter dish of her’s that works perfectly for the standard U.S. butter stick. It makes butter seem like more of a luxury to cut a pat from a gorgeously decorated interior. 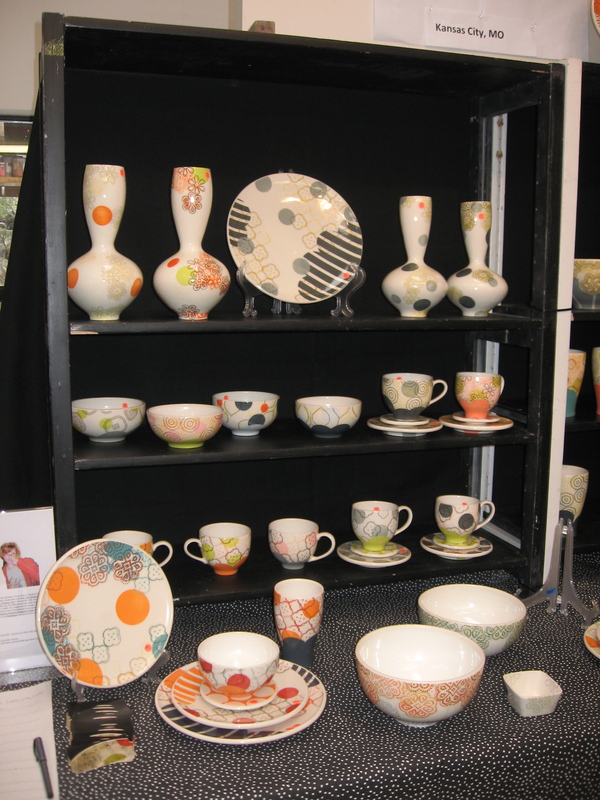 I appreciate seeing the subtle glaze improvements and new decorative touches in each year of Lisa Orr’s work. The little Persian-looking spires attached to the plate edges like lugs or handles were a nice new touch. 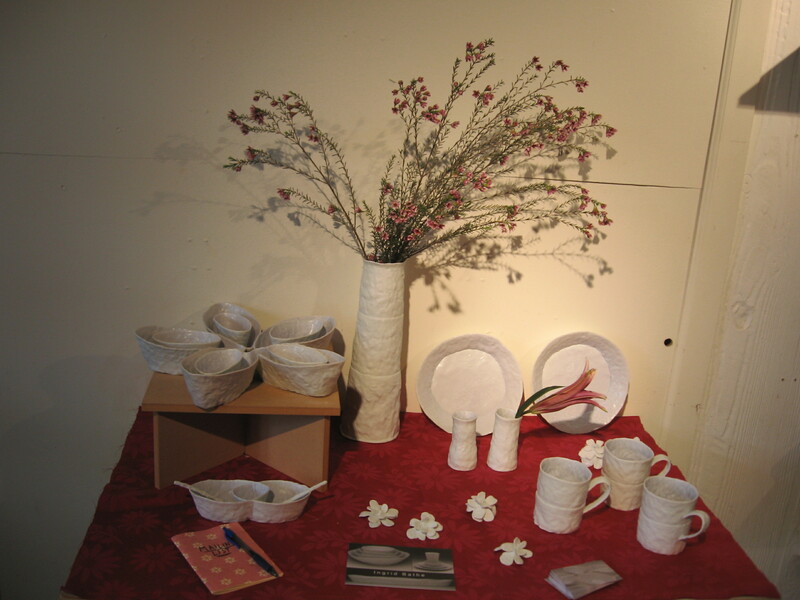 The continuation of Lisa Orr’s display heading back towards her studio. This is a good set of work. I’m loving the variety of size, and a little shout out for that butter dish. I hope it finds a good home. Due to the hand-molded nature of Lisa Orr’s pots, her lids always fit just so and her handles feel perfectly molded to accommodate fingers. It’s something you have to handle to truly appreciate. 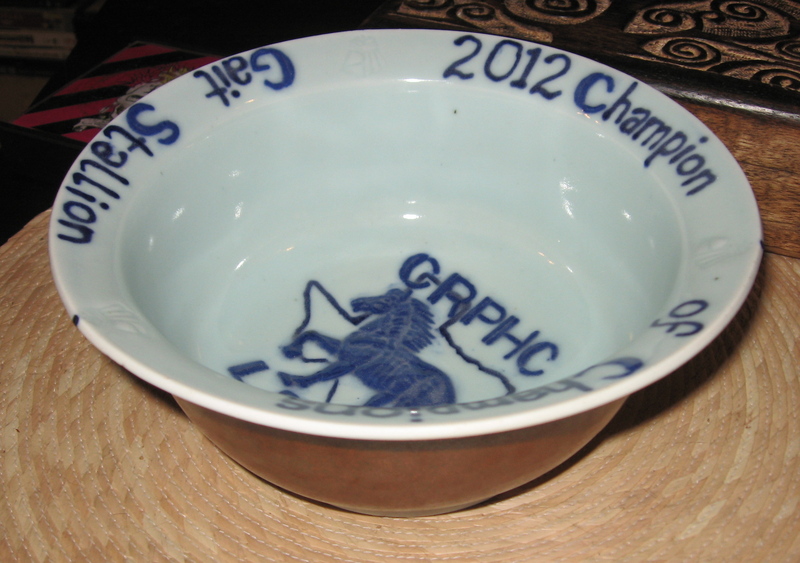 Punch bowl by Gwendolyn Yoppolo. 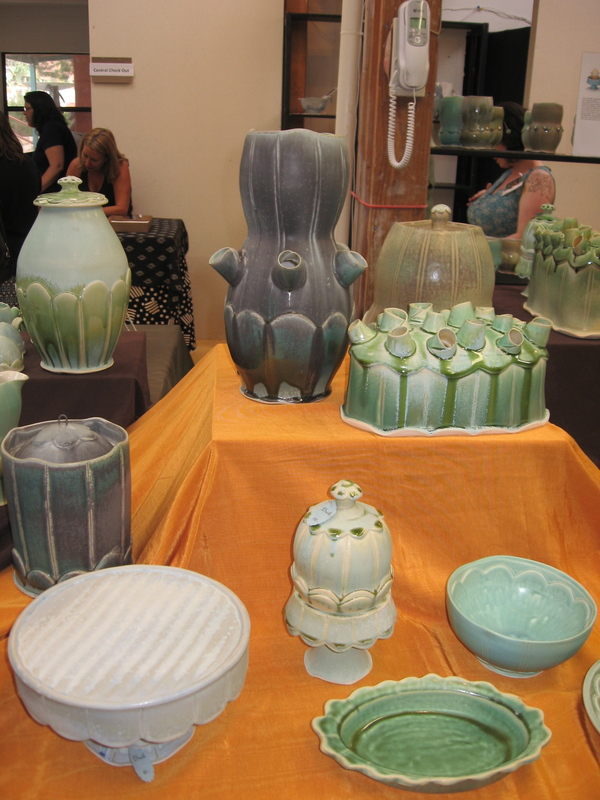 Gwendolyn Yoppolo’s glazes create powdery hued, luscious, microcrystalline surfaces. The pillowy forms seem like just the right match. I acquired one of her mug/saucer sets last year at the Dallas Pottery Invitational. Gwendolyn always tackles a myriad of objects. 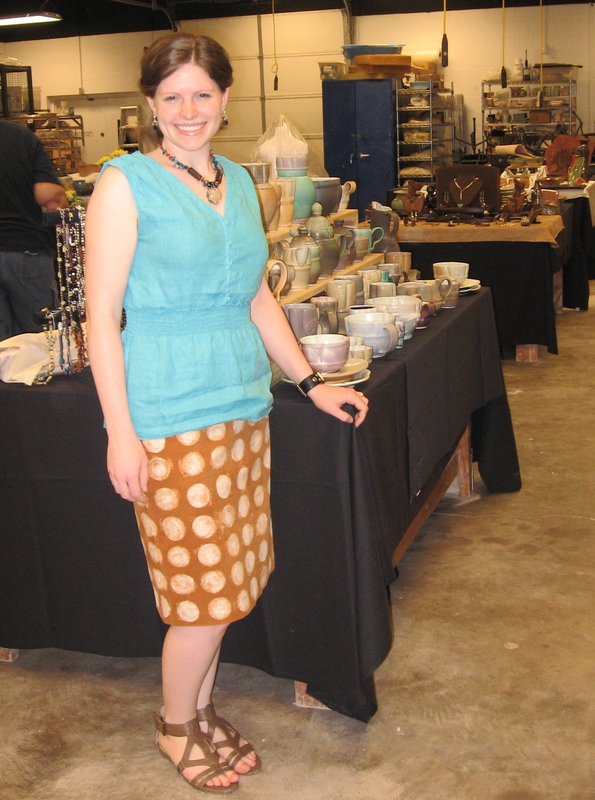 She is one of the few potters I know of who routinely makes reamers, juicers, mortar/pestle bowls, and spoons. The above photo represents a good assortment of pieces in her unique style. 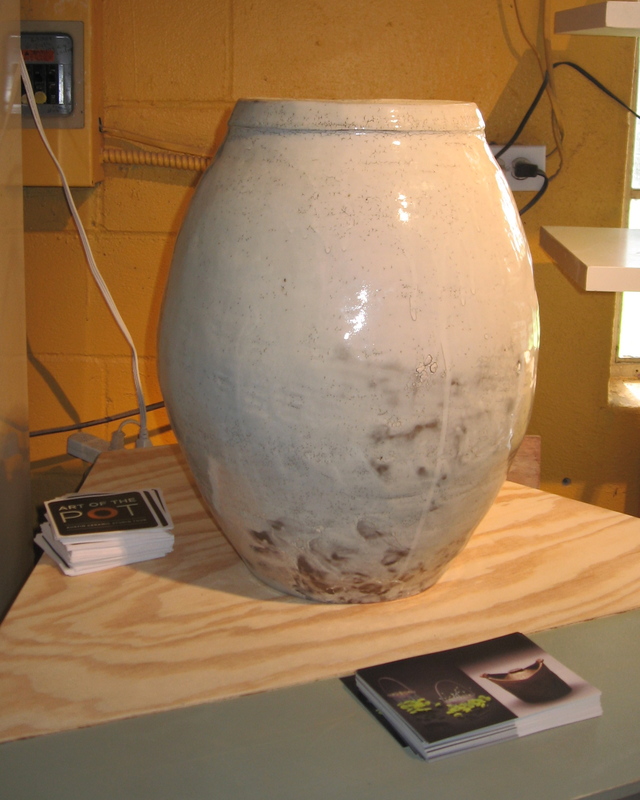 A Gwendolyn Yoppolo fermenting jar. Great idea! And on that note, sauerkraut! The third of four installments regarding the Austin, TX Art of the Pot 2012 tour will follow. Aaron and I rolled in at 1 am last night after a whirlwind overnight trip to Burnet and Austin,Texas. My cousins live in Burnet, and we stayed there Friday night before driving into Austin on Sat morning for the pottery studio tour named Art of the Pot. A giant jackrabbit graced our path down the driveway of my cousin’s rocky, cactus-strewn front acreage as we departed for another Mother’s Day in Austin. 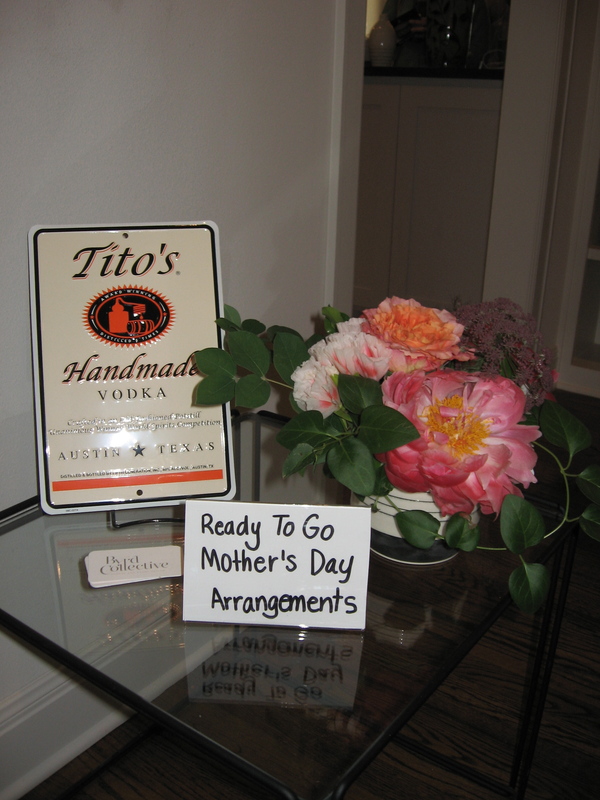 In fact, Art of the Pot always falls on Mother’s Day weekend. I have taken my Mom with me for the tour in past years; that mom-on-daughter time can’t be beat. Anyway, we made the 1st studio by 10:30. The tour ran until 5ish on Saturday, and runs from 11-5 today. We typically do the tour backwards from how the studios are numbered in the mailer, beginning with Ryan McKerley’s studio near downtown on Cesar Chavez. 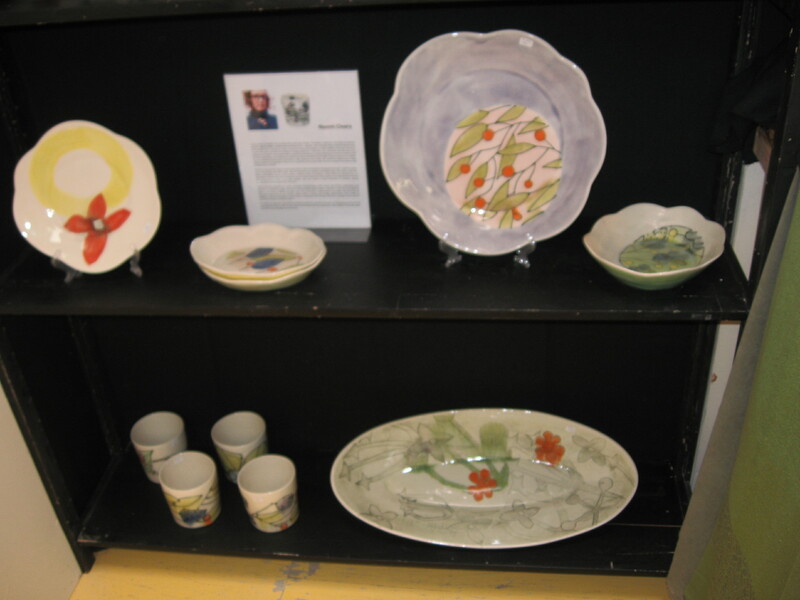 I have known Ryan for several years now; he is an excellent ceramic artist, and a really great person. He shares the studio with Chris Campbell. 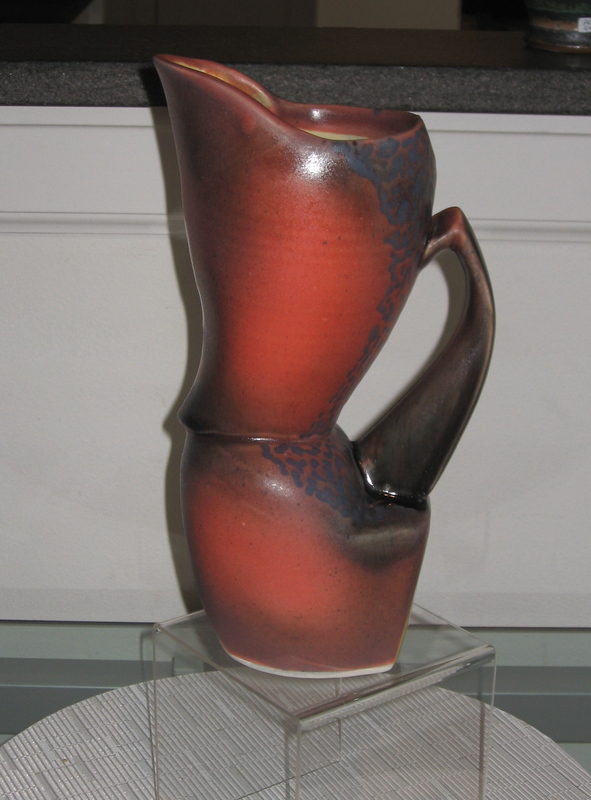 The other potters who had been invited to display and sell work are Carl Block and Ingrid Bathe. Part of Ryan McKerley’s inventory on display in his studio. Ryan’s pots just get more superior with each passing year. To get the dimensional surface texture, each thrown piece receives an application of fixative like lacquer in a hand-painted pattern, which is then sponged heavily to remove clay around the fixed, waterproof pattern. It’s a technique I’ve seen referred to as water carving. 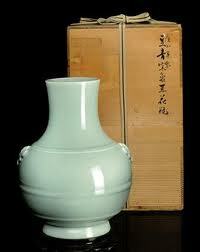 He then glazes and soda fires the porcelain pots to cone 9/10 or so, in reduction. 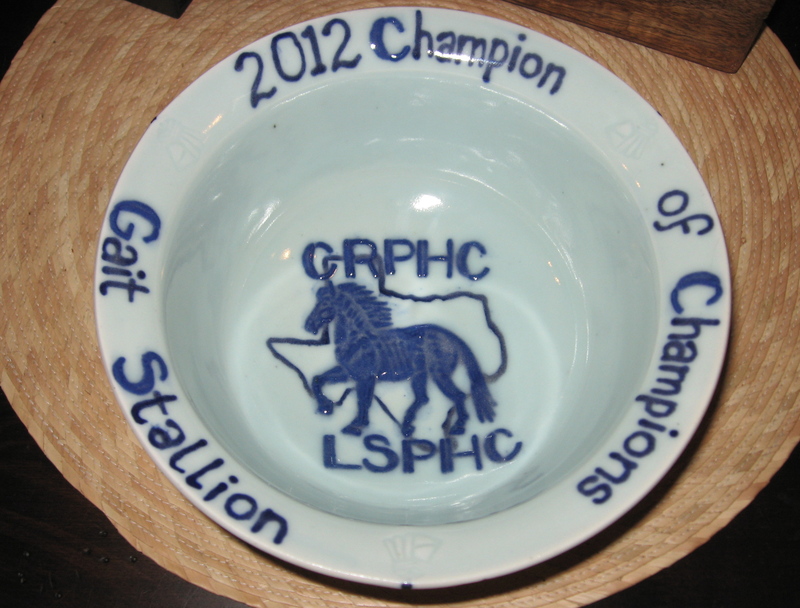 I have had the privilege of firing some of my work in his kiln, and the results are generally spectacular. The kiln I’m building this year is based partially on his kiln, since I intend to soda or salt fire. A close-up of some more of Ryan’s pieces. Chris Campbell shares the studio with Ryan. 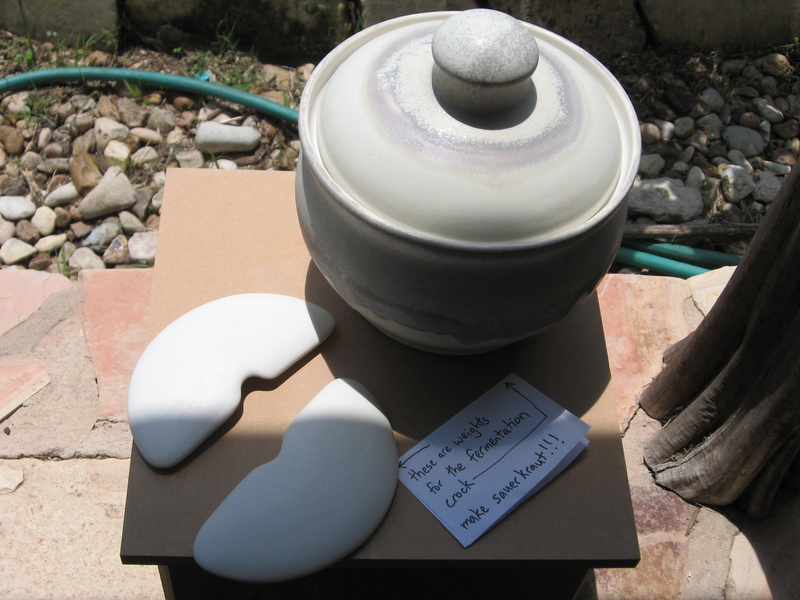 His pots this year were dipped in white slip and glazed clear to emphasize the natural imperfection and beauty of the slip coat. 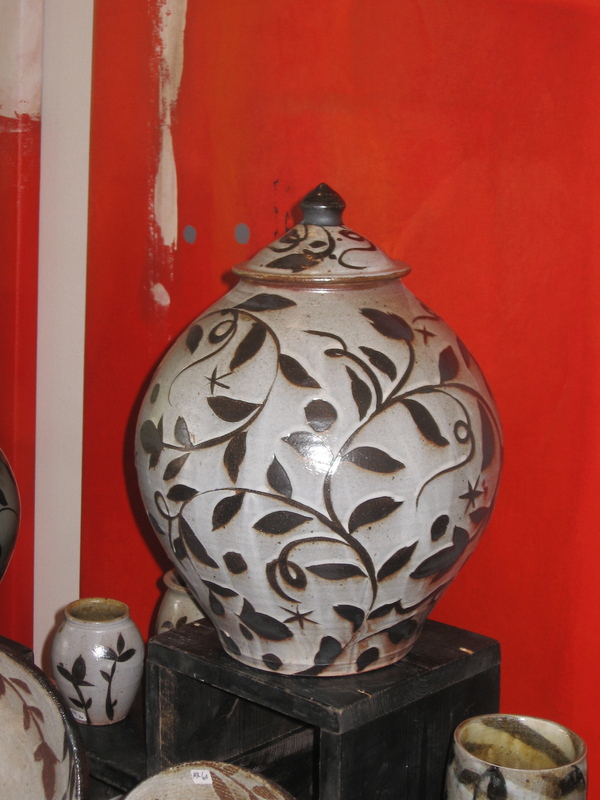 His pots have a genuine solidity, due to elements like the simple forms and straightforward design. 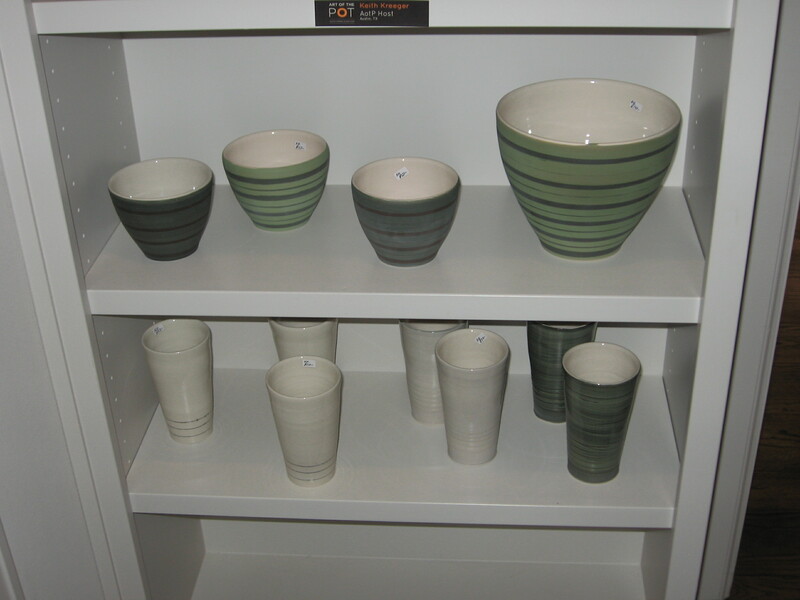 Some of the elegantly simple pots by Chris Campbell. 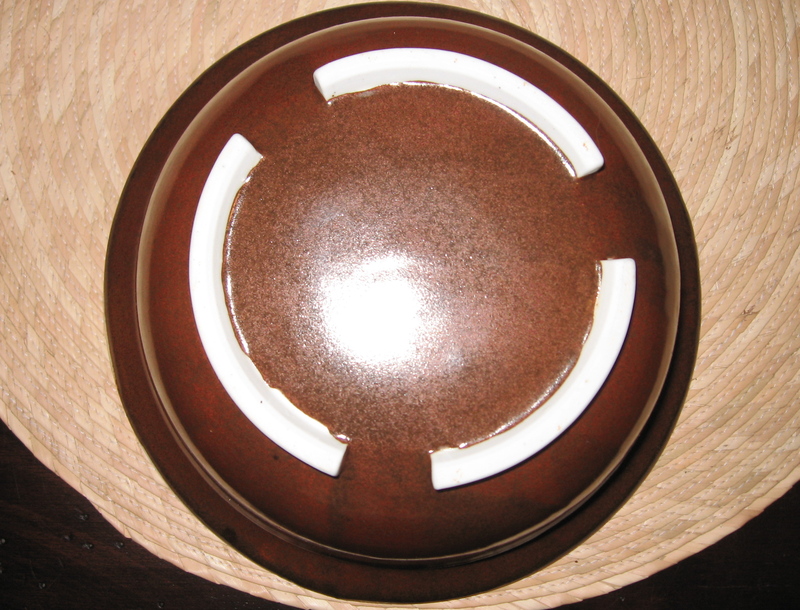 The bowls on the middle tier have a beautifully tall incised foot. I speculate that the feet were thrown, because trimming out that much clay would be a total headache, not to mention wasteful. Also note the finger marks where Chris gripped the pieces as they were dipped in slip: a nice record of the artist’s involvement. 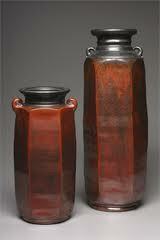 This large jar by Chris Campbell is a beauty. 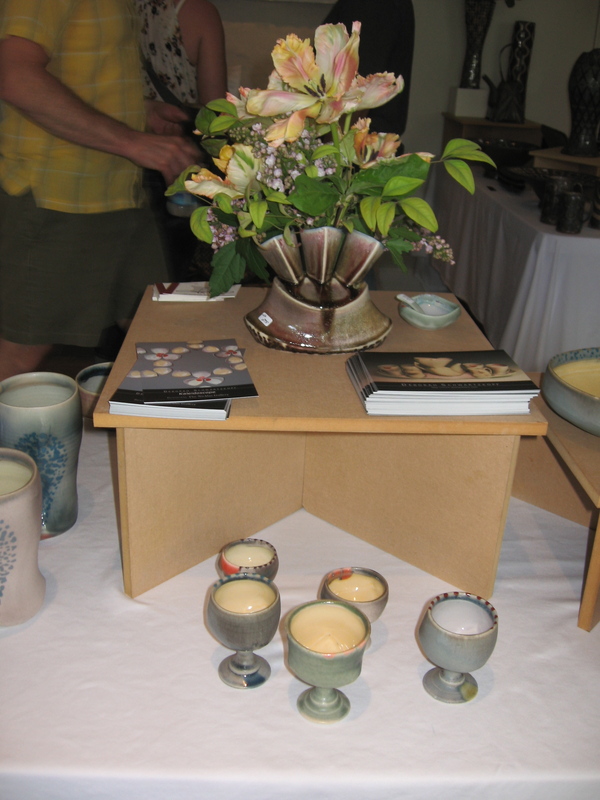 Ingrid Bathe brought her ultra-thin porcelain pinch pots to the Texas art appreciating public. 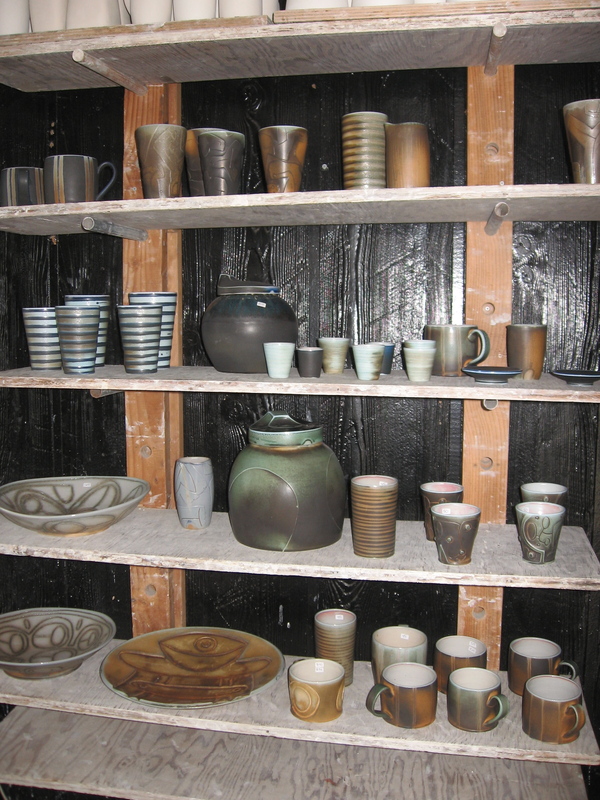 While some of the work was glazed a subdued, cool color on the interior, most were fired raw, probably to cone 9/10. The texture of her process and the vitrified porcelain is tactilely pleasing. A part of Ingrid Bathe’s display. The five-lobed vessel with smaller dishes nested in each nodule was my personal favorite. Such beautiful and interesting work. 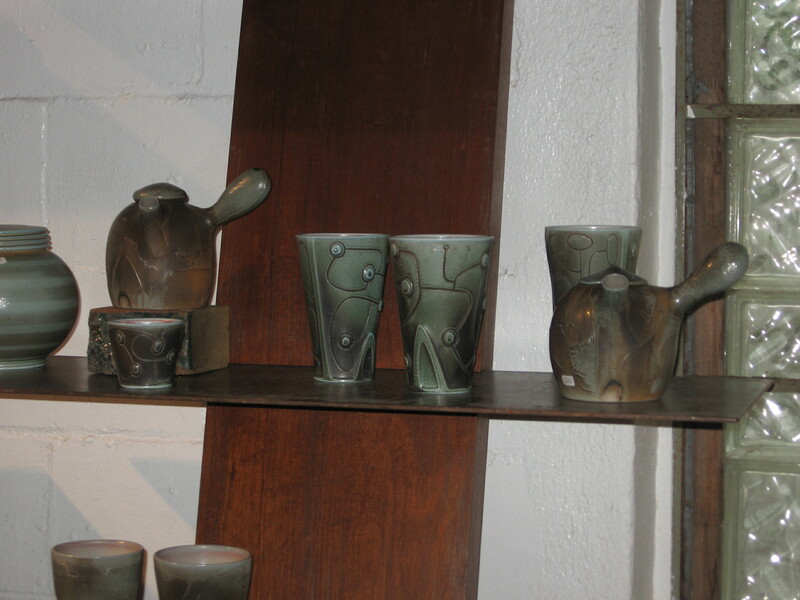 Some of Carl Block’s figurative pots. 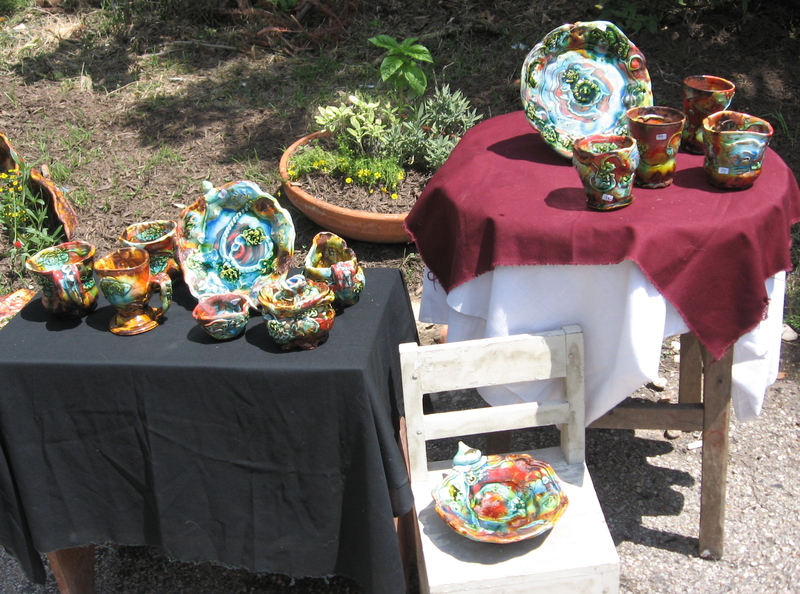 Carl Block of Waxahachie, TX works in earthenware with colored slips and clear glaze, which of course gets low-fired. To me the influence of South American tribal pottery and Mexican folk art appears evident. Carl stated that a major influence which isn’t necessarily visible is the joy that drives his studio practice. The stirrup vessel shown in the back, with the skull and long-bones sculpted on, made a perfect graduation gift for my friend David who just acquired his PhD in Anthropology, with a personal focus in Mayanism. 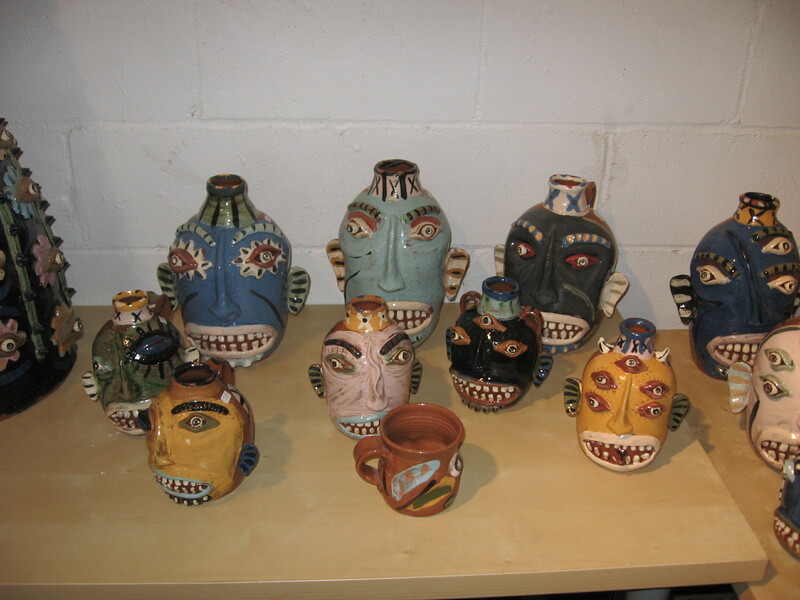 More Carl Block head jugs and jars, and a mug. Mr. Block serenaded the studio visitors on his mandolin, happily engaging folks in conversation when the opportunity arose. He actually gave me an interesting tip for working with porcelain. 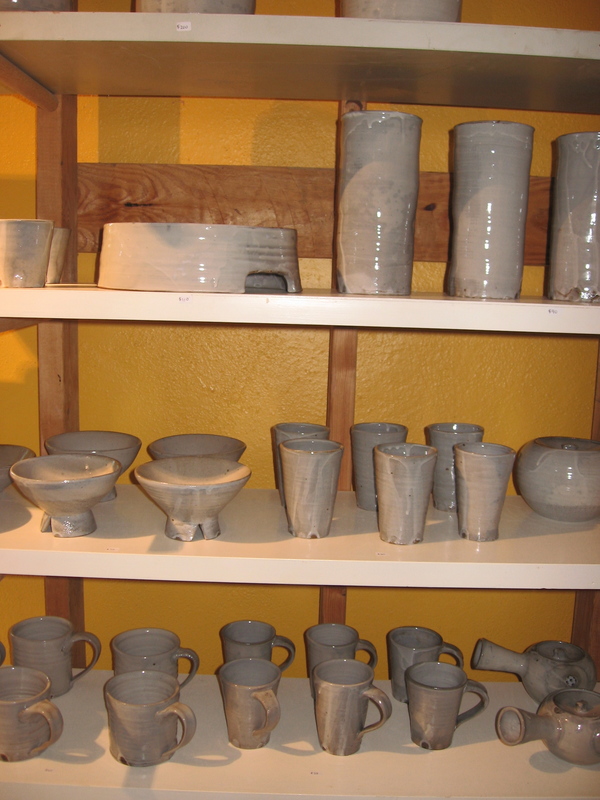 To stiffen the walls of the pots when I’m throwing, I could make porcelain grog to mix in the clay body by bisqueing ground trimming scraps, then ball-milling the bisque craps down to powder. 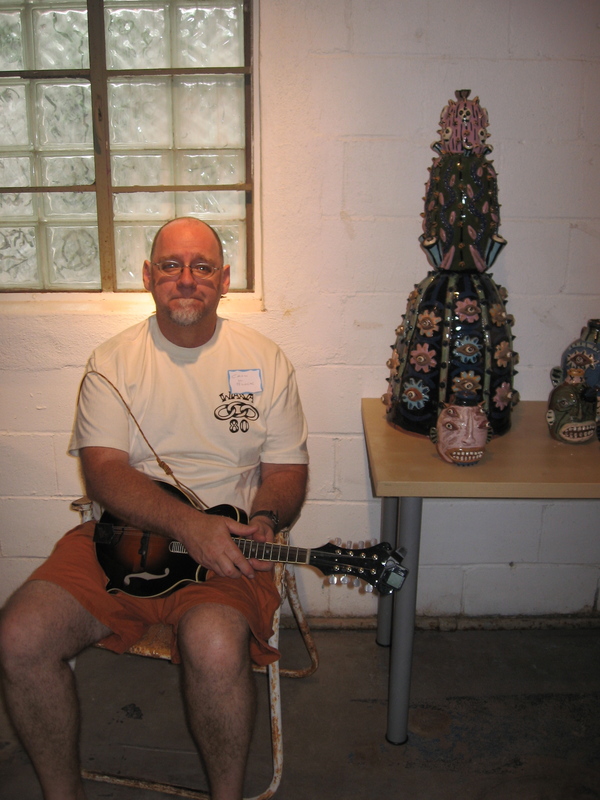 Mr. Block with his mandolin and a tall figurative vessel. Stay tuned for the second of the four studio tour installments. 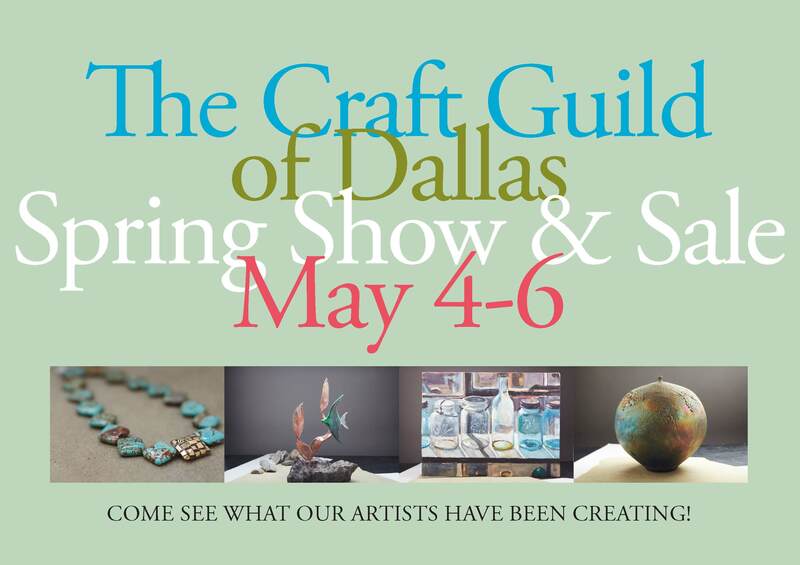 The Craft Guild of Dallas Show & Sale: This Weekend! 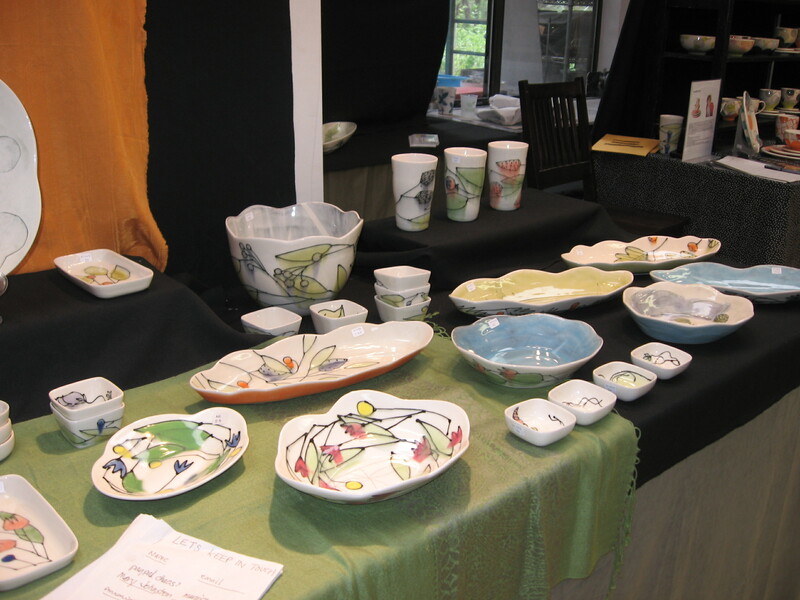 I set up my table at the Craft Guild in Addison today. 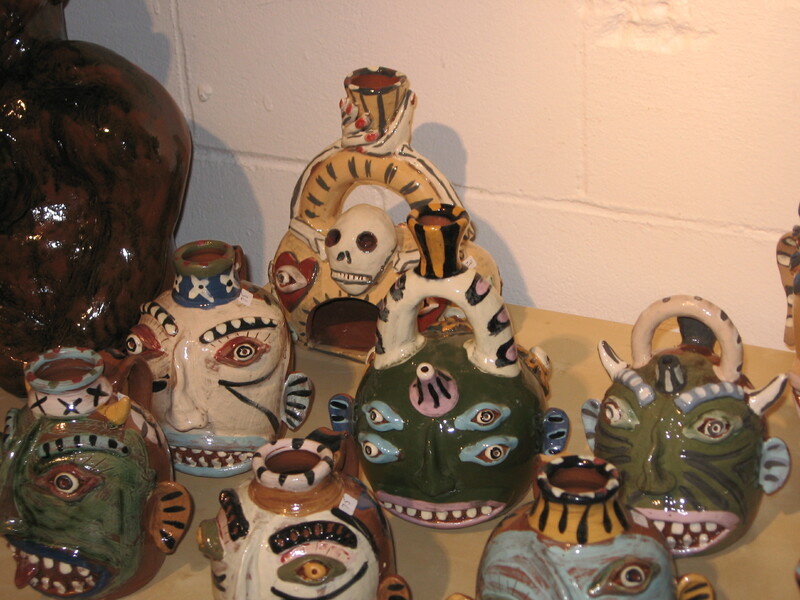 I feel pretty solid about the group of work presently in my inventory: the pots represent my current level of proficiency pretty accurately, are a pretty diverse selection of forms, and I see definite evidence of my aesthetic and symbolic evolution. Here’s the group of work, ready for some thoughtful and discerning collectors to pass by. The reception runs from 7-10 pm tomorrow (Friday, 5/4/12) night, 11 am-8 pm Saturday, and 11 am-5 pm Sunday. I am slated to work the Friday night reception and Sunday from 2-5, so come by during those timeframes to catch me in person. 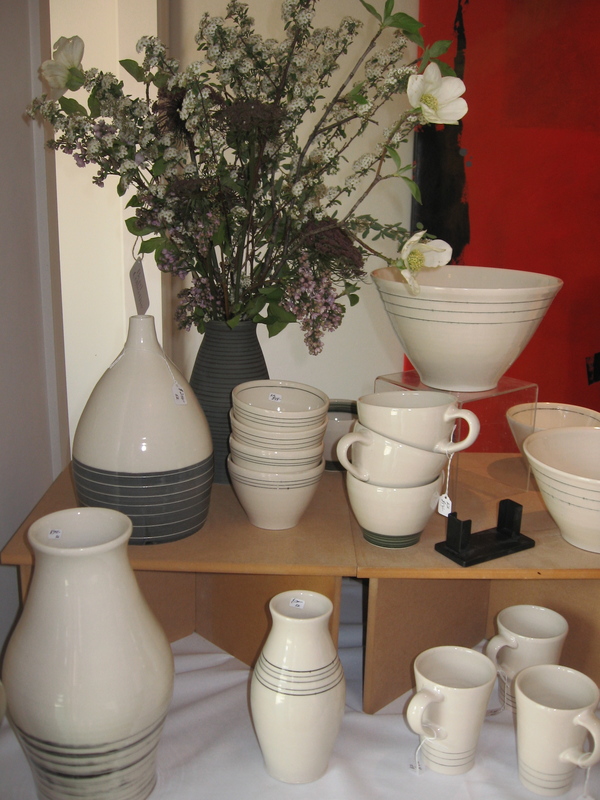 The pots will be available all weekend; those that don’t find new homes, that is. 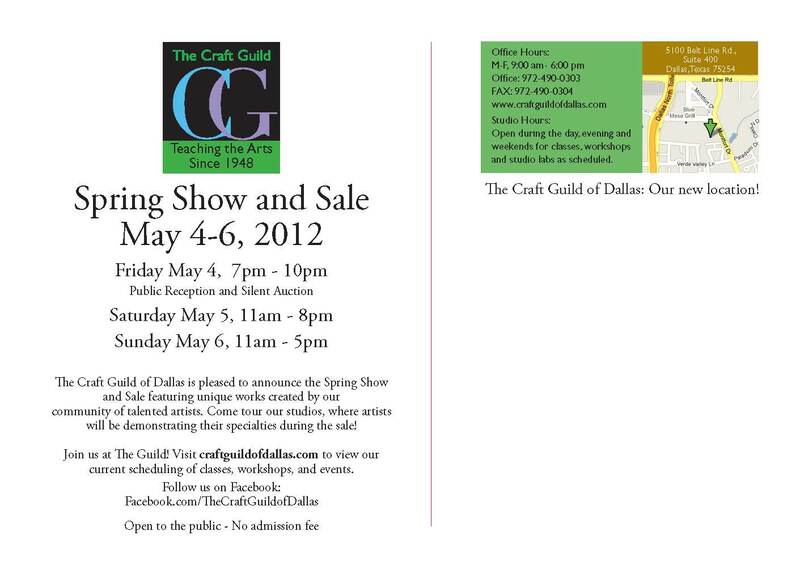 Stop in if you’re able; the Craft Guild is easier to find about 2 blocks down Montfort off of Beltline, just fyi. Look for the suite with Visit Addison in the windows from Montfort, the Craft Guild is intermingled with the visitor’s center. 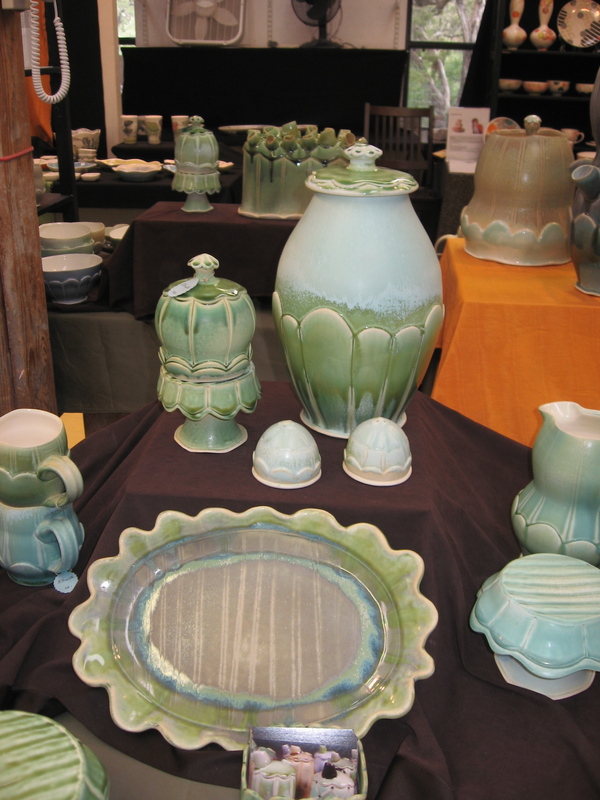 I would love to show you the pottery, give you the rundown on all of the other talented craftsmen and/or artists set up throughout the studios at the event, or simply talk shop about my studio practice. Here I am with the table, tired and happy. What a big day with a few more to come. Here’s the postcard image, front and back side, with some of the particulars.